In this series of articles I have combined the use of a conceptual model of pursuit performance (i.e., the pursuit performance "teeter totter") with a mathematical model of the physics of cycling (7) to assess the relative importance of various factors in determining success in this particular event. The overall approach was described in part 1 (http://www.trainingandracingwithapowermeter.com/2010/04/demands-of-individual-pursuit-part-1.html), whereas the physical and physiological determinants of pursuit performance were discussed in part 2 (http://www.trainingandracingwithapowermeter.com/2010/05/demands-of-individual-pursuit-part-2.html). The role played by various technical factors is considered below. Unlike the physical and physiological factors discussed previously, it is more difficult to determine the precise impact of variations in technical factors, i.e., an individual's technique or skill, in determining pursuit performance. This is because it is much more difficult (if not impossible) objectively quantify such factors versus the physical and physiological determinants of performance. Nonetheless, it should be apparent from the previous discussion that, e.g., a pursuiter's starting technique, per se, plays a very small role in their final overall time (Table 4). By starting technique, I am referring to precisely how an individual achieves a particular power output while accelerating up to speed, their coincidence anticipation timing (i.e., their ability to synchronize their movements with the count-down clock/starting gate), when they choose to sit down during the first lap, etc. Of course, this is not to say that pursuiters should not practice their start with regularity, as such races are not infrequently decided by 0.1 s or less. Clearly, however, a high degree of skill in starting is far less important to a pursuiter than, e.g., a kilometer or 500 m specialist (or even a team pursuiter), and this fact should be reflected in the relative emphasis placed upon start practice in a pursuit cyclist's training program. Table 4. Time changes resulting from variations in technical determinants of pursuit performance. In comparison to the individual's starting technique, their skill at riding as low as possible on the track can have a large impact upon their performance. For example, riding just 20 cm (~8 in) up from the measurement line will cost a pursuiter almost 0.1 s per lap on a 250 m track, or 1.1-1.3 s (0.5%) overall. Thus, riders should (and of course do) strive to ride as low on the track as possible when in the turns, especially when competing against a closely-matched opponent or when it is important to achieve the lowest possible time (e.g., qualifying, record attempt). On the other hand, knowing precisely how much time is gained/lost based on the line taken in the turns may provide the rider with the confidence needed to wisely "play it safe" in other situations, to avoid hitting a sponge and potentially crashing. Similarly, understanding the quantitative effect of other possible lines on the track (e.g., swinging wide in the straights) can help an athlete and/or coach choose an optimal path for a given track (and rider). The third, and probably most important, aspect of skill or technique that influences a rider's pursuit time in the context of the physical and physiological factors previously discussed is pacing strategy. Contrary to what is believed by some, perfectly constant split times do not appear to be ideal (although such a pacing strategy is not far from optimal). Rather, modeling of pursuit performance based on physical and physiological information (6,8) suggests that a slightly faster overall time results when a peak velocity greater than the average steady-state velocity is achieved during the 2nd lap, with a very slight slowing (i.e., less than 1 s/km; corresponding to a gradual decline in power of ~15%) occurring thereafter. This conclusion is consistent with actual practice (9). I suspect that this somewhat counterintuitive strategy is the result of two factors: 1) by starting at a pace or effort slightly greater than that which can be sustained, utilization of your full anaerobic capacity is assured, and 2) any kinetic energy you have when you cross the finish line is "wasted", in the sense that it can no longer be used to improve performance (8). This latter concept seems to be especially important in the kilometer (and probably even more so in the 500 m), but apparently also applies to the pursuit. On the other hand, it is far more common for pursuiters to start out too rapidly than too slowly, even at the elite level. This was evident in, e.g., the recent 2010 World Championships, in which the highly anticipated showdown between Jack Bobridge of Australia and Taylor Phinney of the United States for the gold medal failed to materialize after Bobridge qualified in 3rd place. 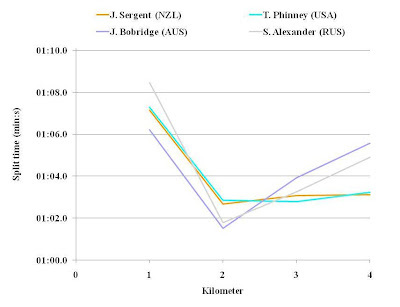 Based on the official kilometer split times, it is clear that Bobridge started out consideraly faster than Phinney or the eventual silver medalist, Jesse Sergent of New Zealand, then slowed down far more than is ideal during the latter stages of the race (Figure 5). In contrast, the 4th place qualifer, Alexander Serov of Russia, started out more conservatively than the other three, but then accelerated too much during his 2nd kilometer in an apparent attempt to make up time. Figure 5. Kilometer split times for the top four men during qualifying at the 2010 World Championships. While in many cases riders must aim for a particular time that they believe is necessary to win even if this means risking "blowing up", it is nonetheless natural to wonder how the results of this recent competition might have been altered overall if Bobridge (or Serov) had paced himself differently in qualifying. The negative consequences of starting too rapidly during a pursuit are largely due to the impact that this has upon the rider's physiology, i.e., the reduction in power that results from premature fatigue. However, even if a rider is sufficiently well-trained so as to largely withstand these negative physiological consequences, they may still go slower as result of a differences in the physics, i.e., an increase in aerodynamic drag resulting from the higher peak speed. 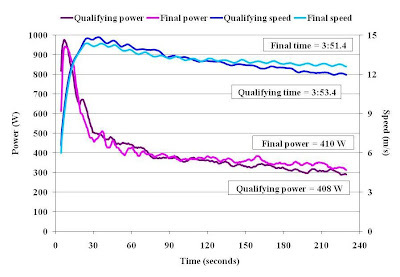 This is illustrated in Figure 6 below, which shows the speed and power of a female track cyclist during the qualifying round and during the final round of a recent U.S. national championships. Figure 6. Effect of pacing on 3 km pursuit performance when overall average power is equivalent. The rider whose data are shown was considered an inside favorite to win the jersey, having shattered their personal best 3 km time in training just a few weeks beforehand. Nerves got the better of them in qualifying, however, and they started out too fast and then "died a thousand deaths" during the final kilometer (to the point that they could not dismount from their bicycle, but had to be lifted off by their handlers). Had the competition been run under current rules, this mistake may not have proved too costly, as they still posted the 2nd fastest time in qualifying. At the time, however, the 2nd and 3rd (and 1st and 4th) fastest riders still met in a semi-final round, meaning that they had to face another athlete who at the time was ranked #1 in the pursuit by the UCI and who just a few weeks later placed 7th at the World Championships. Fortunately for the rider in question, they were able to adjust their pacing strategy and went on to win nationals in a time 2 s faster than they recorded in qualifying, despite the fact that their average power differed by only 3 W, i.e., by less than 1%. To illustrate the various points made in this series of articles, I have assumed nominal values for parameters used to perform the modeling. It is unlikely, however, that the characteristics of any given individual will perfectly match these assumed values, i.e., the room for individual differences exists even if performance itself is equivalent. In particular, although the relative distribution of power is unlikely to vary significantly between athletes (as evidenced by the similar relative distributions shown in Figure 1 for 4 km and 3 km events), the absolute power required to achieve a certain time can vary. Likewise, athletes may differ in terms of the exact combination of aerobic and anaerobic energy production yielding a particular power output. An example of the latter is discussed on pages 247-248 of Training and Racing with a Power Meter. The point that I would like to emphasize here is that the systematic approach to analyzing pursuit performance that I have described can be used to identify and then capitalize upon such individual differences to optimize a given rider's preparation and training. In other words, it is the process that I have presented, rather than the exact outcome, that is most important. In my experience, it is actually the 2nd half of the 1st lap that is most important, as it is during this part of the race that riders are most likely to "overcook it", i.e., to continue to accelerate beyond their goal pace. Because half-lap splits are not recorded as often as full laps splits, however, most coaches and athletes believe that it is the 2nd lap that is critical. Nice article - will use some of this in my needs analysis im doing for my masters degree - cheers.